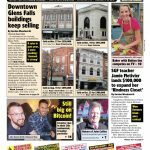 Home sales in the City of Glens Falls have jumped 29.3 percent so far this year. There were 97 sales through July 31, up from 75 in the same period last year. Thirty-three of the 97 homes sold for between $100,000 and $150,000; 85 were less than $200,000.